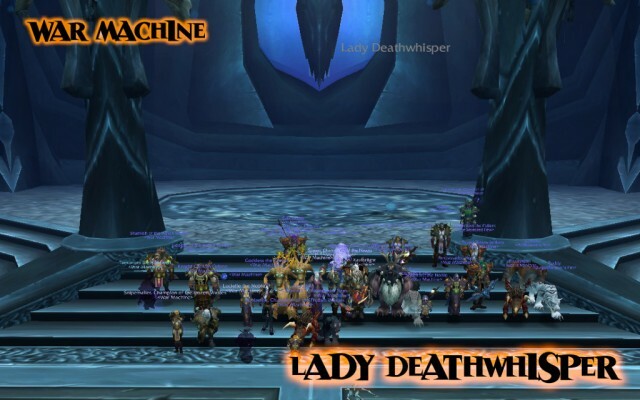 Last Saturday was War Machine’s first night as a guild raid in Icecrown Citadel 25 man. We had a great turn out and started out pugging 2 people who really weren’t pugs in the sense. We started out kind of slow. We had problems with people disconnecting during some of the trash fights, but besides that, we moved through it without any deaths. Lord Marrowgar was a fun fight. We got some bad luck with the Bone Spikes and Bone Storms popping almost at the same time and had to wipe on our first attempt. But! on our second attempt we smashed him which was our first victory in ICC 25man. Congratulations to all those who got gear from this boss. It was a fantastic victory for us as a guild to down our first boss in there. She didn't leave much behind, huh? We made our way to Lady Deathwhisper and cleared the trash before her without any problems. This is kind of a difficult fight and we had a few tries at her until we got the fine tuning down and we downed her in our 3rd or 4th try. We asked people to read up on the fight and it showed that we did our homework. Our goal was to go in and just have some fun and downing our second boss blew away any expectations we had for our first night. It was a great feeling when we downed her and it was another fantastic victory for War Machine. It was getting close to our 11:30pm raid end time but we decided to continue and try our luck with the Gunship Battle. It’s a relatively easy fight and we figured, “Hey, FREE LEWTZ!” So we went in and had a try at it. Some of us had some complications as to what we were supposed to be doing and we wiped our first attempt. But wiping there didn’t get us down because on our second attempt, we knew exactly what we were supposed to be doing and we defeated the Gunship Battle encounter for our 3rd boss in Icecrown Citadel 25 man! What what what?! War Machine downed 3 bosses in ICC on our first night in there! It was just icing on the cake. By that time a few of us had to leave and we called it after that encounter. I forgot to get a screenshot of the Gunship Battle so if there’s anyone that got one, please let me know and I’ll try to get one up. 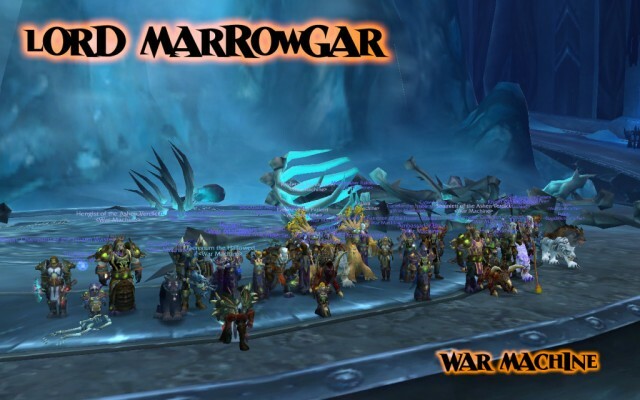 So our first night in Icecrown Citadel 25 man was a complete success! Not saying we don’t have confidence in our guild, but going in for the first time as a guild and downing the first three bosses really blew away our expectations. Everyone should give themselves a big pat on the back for how well we did. Great job everyone! We’ll be doing this every Saturday so read up on the next bosses. We’ll make posts in the forums with quick links to the boss fight strategies. Since we got up to Deathbringer Saurfang, he will be our next boss to study up on. We also should study up on Festergut as well. Defeating Saurfang will be a great achievement for the guild because we get the [Storming the Citadel (25 man)] achievement. Although some of us have that achievement already, downing that far as a guild is a great achievement. So again, great job everyone. You all did very well. Lets keep this up and get us some more gear in ICC 25! This is the first boss in ICC. His strategy doesn’t change much from the 10man strategy. Everyone needs to be aware of his different abilities so read carefully. Very fun fight. Although there are only 2 phases to this encounter that switch back and forth, it’s enough to keep you on your toes. This encounter can be rather difficult if you have never done it before. Ranged DPS be sure to read carefully. Your ability to kite and destroy adds will come into play this fight. Saurfang is the fourth boss in ICC and completing this encounter will earn you the achievement [Storming the Citadel (25 player)]. This boss also drops Marks of Sanctification Tier 10 tolkens. We are all excited to be going into ICC 25man as a guild for the first time. Our main goal for our first couple of runs is to have fun! Don’t worry yourselves about how far we get. Raiding is a learning process and and if we can’t have fun while doing it, why do it? So come prepared and lets have some fun! We may have to PUG a few so be on good behavior and show them how fun of a guild we are. Icecrown Citadel 25 mans are imminent! Arthas hears about War Machine's 25 man plans. We are proud to announce that War Machine will once again begin it’s foray into 25 man content with our new weekly run into Icecrown Citadel! This will begin on Saturday the 24th! This is a great opportunity for the entire team to get together and see how well we do. Everyone will be there, and this is sure to be a wild fun night in the coming months. Expect wipes, loot, and the usual vent cutting up. We *will* be pugging some to bolster the numbers, but as these are our first times in as a guild group, the focus will be F-U-N more than progression. That said, remember we do expect you to KNOW the first two fight strats for 25 man (also note, knowing means more than watching one video). But if the first boss falls great, if not beeg deeel! The point is we all get in one space organized together and get things moving. Later, we’ll start to look at what our problem areas are … Strats/preparation? Gear? Raid awareness? etc. Again, if you know your gear isn’t up to snuff for ICC25, start gearing NAO (we’ll help of course). This is the last big instance until Cataclysm, which is expected before year end, perfect time to jump in, both feet first. We will get to taste some of the “good stuff,” get excited!! A couple of us got to go in and see some new content. Congratulations to those that downed bosses for the first time. We all did very very well considering we downed Thorim and Freya in one shot. Great job guys. Great job today guys. A bunch of us got our Classic Raider achievements and a few of us saw AQ40 through to the final boss for the first time. Congratulations to all who came. This run wraps up the Vanilla WoW raids for the moment and we’ll move on to BC raids next week starting with Karazhan and we’ll work our way up from there. If you would like to join us for some fun and laughs, sign up on the event calendar. Old School Raids will be held every Sunday at 12:00pm server time. Again, thanks to all who came and lets do it again next week! Great night guys. We went in and downed ol’ Kael’thas Sunstrider. He was a push over! Grats to those that got the achievement for clearing Tempest Keep! After Tempest Keep we decided to go in and take a shot at Sunwell Plateau. We one shot Kalecgos and Brutallus, but we had to do a few retakes on Felmyst thanks to Anjanti’s “Stand on star!”, and die… But, Dakhan took up the slack of Anjanti’s fail raid leading and we downed her on the next attempt. After that we had a few tries at the Twins until we got the whole mechanics to the fight down and moved on to M’uru. Although M’uru is an easy fight, it is kind of technical and we took a few shots trying to get “it” down. It was getting late and we had a few people that couldn’t continue so we called it at M’uru<, but we have a plan to go in tomorrow and see what we can do about finishing the instance. Again, great job to all those that showed up for raid. We’ll be doing an Old School Raid run for AQ 40 at 12:00pm server so show up to see some old content for the first time or relive the glory days! We went back into Sunwell at 4:00pm on Sunday and downed M’uru and Kil’jaeden. A lot of us got the Sunwell Plateau achievement so congratulations! Fantastic work guys.